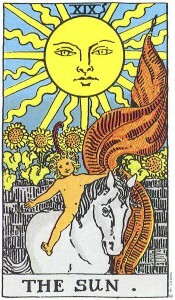 The Sun is a Major Arcana card, one of the twenty two most powerful cards in the Tarot deck. 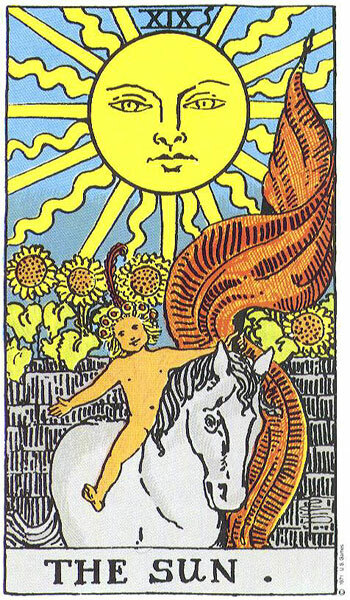 And just like you might imagine, drawing the Sun is a sign that everything is coming up bright and bountiful for you. It’s the card of good health, fortune in love, happy times, success in creative ventures, and joy all around. If you’re about to engage in physical pursuits, the Sun presages great success. If you’ve been trapped in a dreary situation, you’re about to burst into freedom. In addition, if there’s anything that’s been hidden away from you, the Sun can indicate that you are about to have very clear vision into whatever you are seeking. 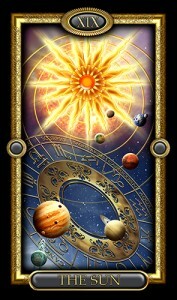 In a reading, this card indicates joy, goodness, and wonderfully bright days ahead! Whatever you are seeking, the odds are in your favor that you’ll receive it.